Introducing a new line of engagement rings built with you in mind. These original designs are handcrafted in our Sacramento studio using recycled gold and lab grown diamonds. Every aspect, from the design, to the materials, to the craftsmanship was carefully chosen to give you a ring that you can be proud of. For most of us, the engagement ring is the largest jewelry purchase we will make in our lives. It is a daily symbol of love and commitment, but it can be even more than that. As you look down at your ring each day and as your friends reach out to see it up close, shouldn’t you be proud of what you’re wearing? Shouldn’t it be a reflection of who you are? We created the Balance collection to give you a new choice in the sea of engagement rings on the market today, a choice to stand out from the crowd, a choice to make a statement, a choice to find new meaning in an old and treasured symbol. What does it mean for an engagement ring to be earth-friendly? For us it means minimizing the environmental impact of every possible part of the ring’s production process. So, when it was time to choose a metal, we didn’t take the easy route and opt for pre-processed gold from a refiner that claims to be eco-friendly. We took it a step further and cast the Balance collection from gold that we recycle ourselves. We hand select quality pieces from the scrap jewelry that we buy and melt them down ourselves to use in the Balance collection. It takes a lot of extra time and patience to sort through the jewelry looking for pieces that are pure enough to be re-cast, but to us, it’s completely worth it. But, we didn’t stop with sourcing earth-friendly gold. We chose to use high-quality, lab grown diamonds exclusively in the Balance collection to completely eliminate any environmental impact from diamond mining in these pieces. From the largest center diamond to the smallest accent, every gem is 100% lab grown, produced by reputable diamond growers from all over the world. They are identical to natural diamonds in chemical composition, light properties, hardness, etc. They are not cheap imitations like Cubic Zirconia (CZ). They are real diamonds. 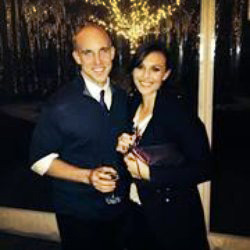 Why Buy a Balance Engagement Ring? You have a lot of excellent choices when you are looking for an engagement ring. 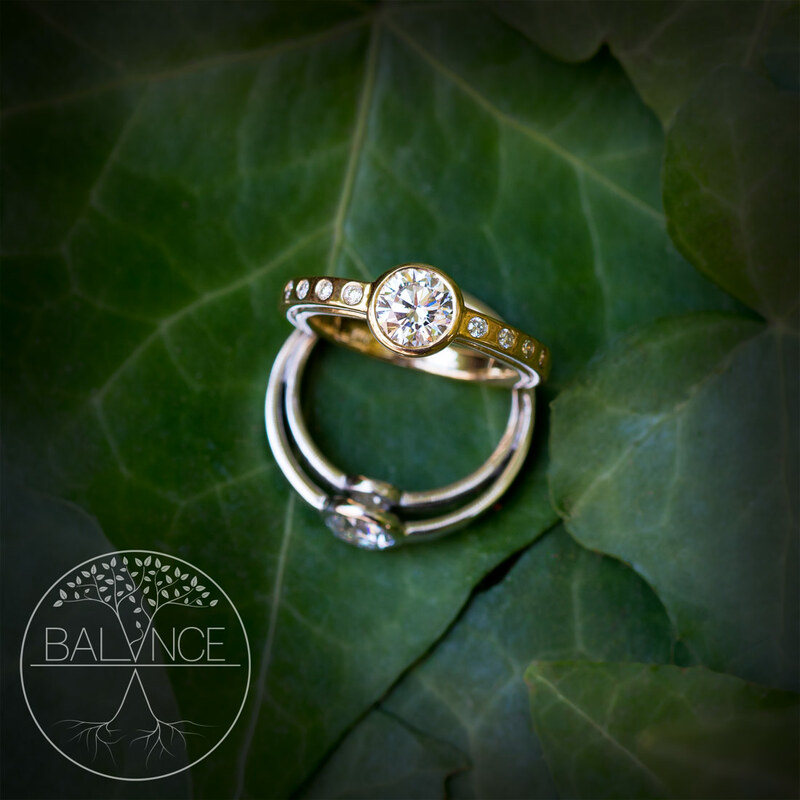 When you choose a Balance engagement ring, you are making a statement, a statement that you are an individual, not a number, and that you care about the world around you, not just with your words, but with your actions. 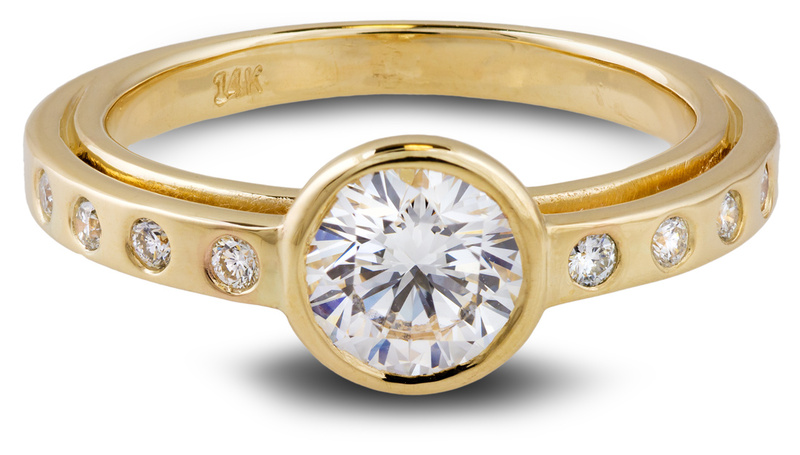 Cutting edge design sets the Balance collection apart from other engagement rings. You’re not like everyone else, so why buy a ring that looks like everyone else’s? 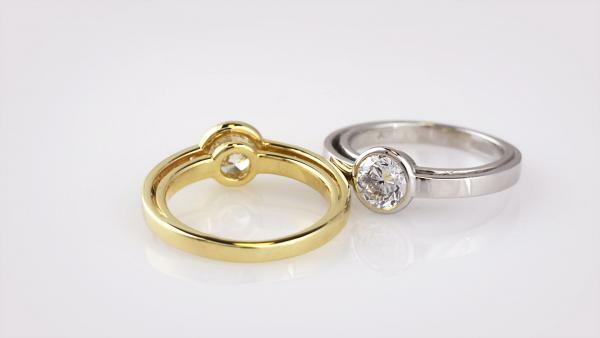 Using recycled gold and lab grown diamonds means you can sleep easy at night knowing that no gold or diamonds were mined to make your engagement ring. Our lab grown diamonds cost between 30-35% less than comparable earth-mined diamonds. So, your budget goes farther without compromising on quality. Find the ring that’s right for you. If you have any questions, or if you’re interested in customizing one of the Balance rings, please don’t hesitate to contact us. We would love to help in anyway we can. 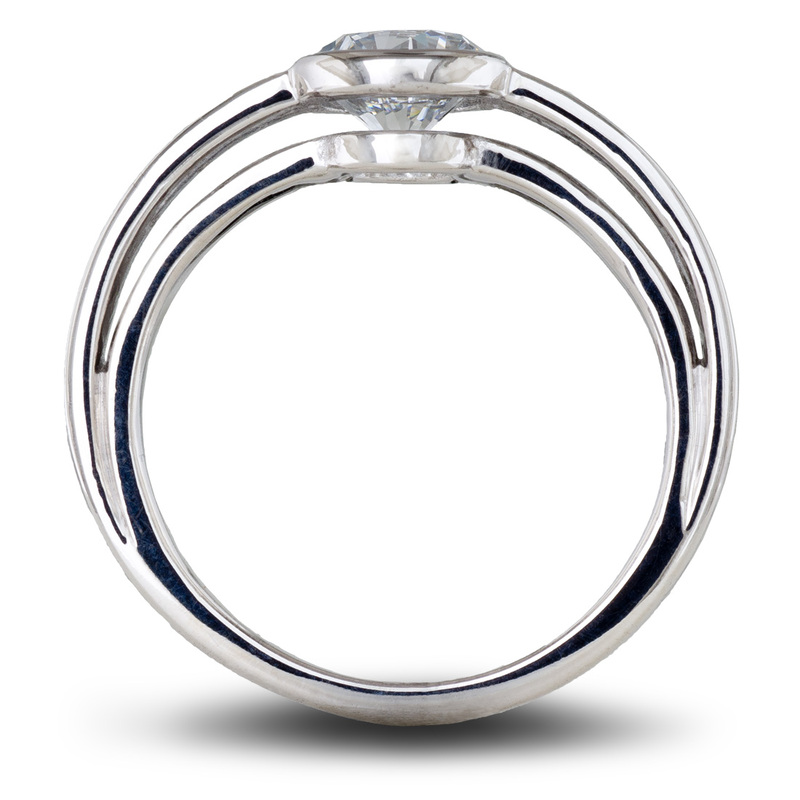 Shop online (with free shipping & returns) or contact us to talk with our gemologists today!